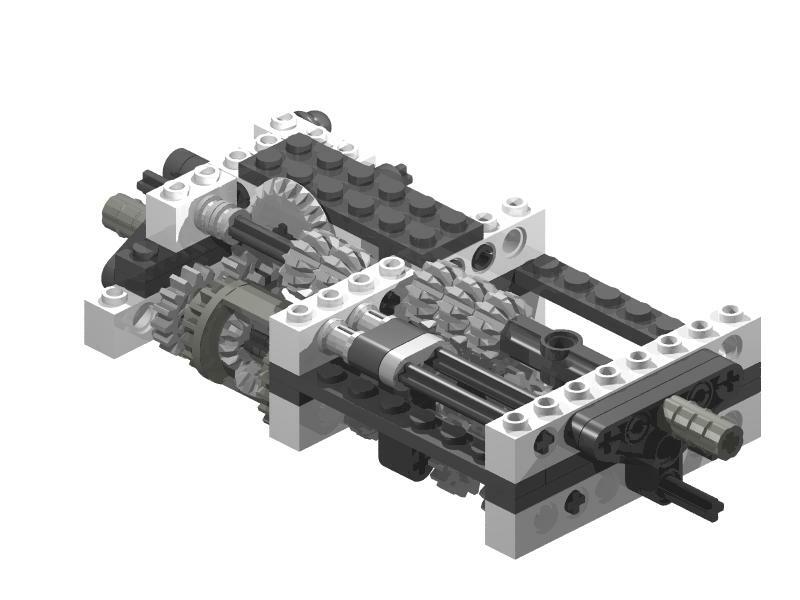 Misha Van Beek (miezel for his folder at Brickshelf), is a LEGO TECHNIC talented builder, who among other constructions developed a few Automatic Gearboxes. The subject of TBs TechTips today! Below it is Misha's 1st automatic gearbox attempt whose building instructions, could be found here (read also the mechanism explanation by clicking, to magnify the image). At its right side it is a video from Paul (formerly referred as S.Ariel here at TBs) who built and tested this model. 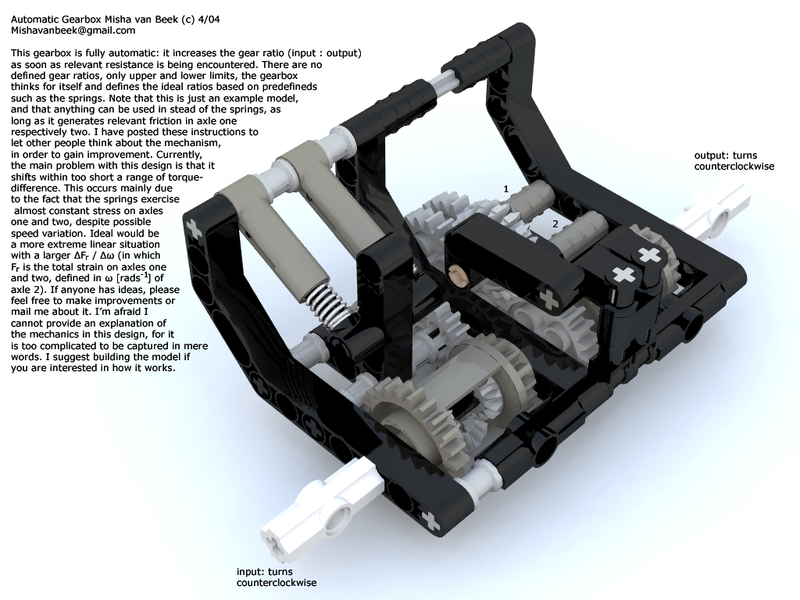 Misha made a 2nd attempt for this 3 speed automatic gearbox and optimized it together with Alex Zorko (yes, the owner of the TECHNIC website nicjasno.com). Below you can find again the author's model photo and one video for the correspondent implementation, made again by Paul. The building instructions can be found at Misha's Brickshelf folder or at his website (MINDSTORMS Manifest), where you can read also a detailed explanation for its working internals. Below, two other videos that implement the same gearbox in a studless version by 'timoonn'. Finally and still about automatic gearboxes, look at another implementation video, from what I believe to be a totally different approach, however not documented. From what I understood, this car shifts itself according to motor cycles. It uses a light sensor tachometer to count cycles, as it can be easily seen here. Shifting is according to turning speed of the wheels. You can see that while they get slowed by using manual force, the gear is changed. This is also a 3 gears implementation, or in other words a 3 speed gearbox. Two motors are applied to transmission and one motor is used to change gears. Personally would like to see more in detail the mechanism attached to the motor, that changes the gears. Search for 'bencizdim' at YouTube, and a few other videos for the same project can be found. and many other related stuff, here. Thanks for the tip. I just finished building it (version 2 with the studs) and it's really cool. Nice job, it was lots of help. I was looking on google for automatic transmission and a gearbox in general made of lego, but found nothing useful. This page contains links to building instructions and all the stuff you need! I was trying to build something like this myself, and failed. I was close, but not close enough, My system was like system 2, but slower and more gear grinding then doing anything else.